My swim window is 16-22 December and this is fixed. 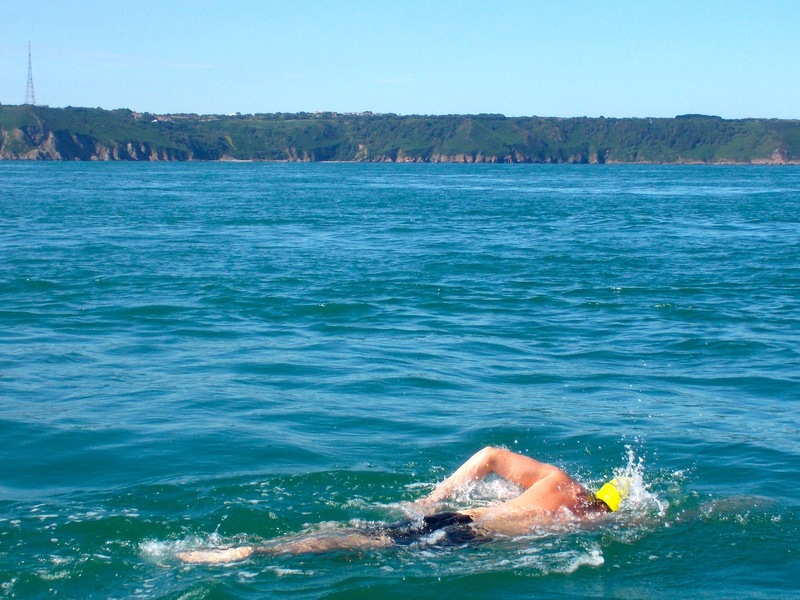 The reason for booking a seven-day window rather than a single date is that the swim requires reasonably calm sea conditions for the best part of a day, something that, given the local climate and exposed nature of the route, cannot be guaranteed for any given day at the time of booking the swim, which is often months or even years beforehand. So, booking seven days rather than just one means that I have a much better chance of actually getting to swim. From the day I arrive in Rio, I will be in regular contact with the Leme to Pontal Swimming Association to discuss weather forecasts and should be able to confirm the actual date and time that I will start the swim a day or two in advance. Keep an eye out for updates! 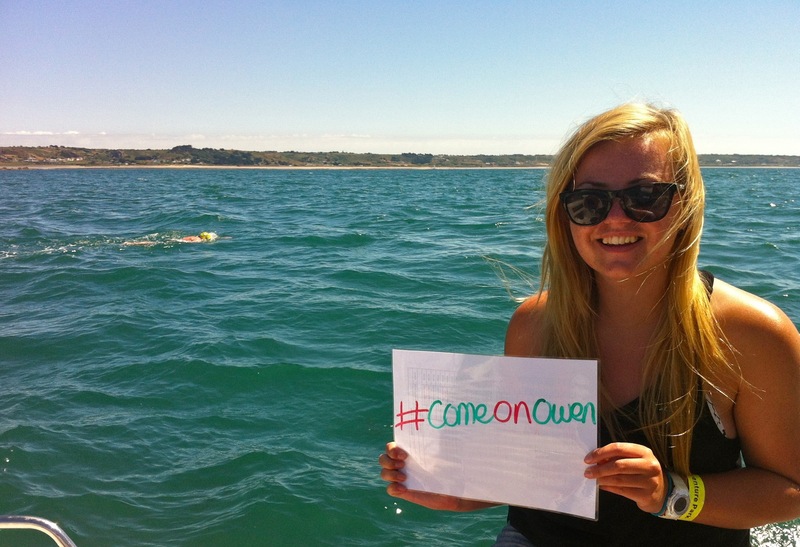 Chantelle holds up one of the Twitter hashtags that were being used during the swim. These have been popular with Channel junkies since we got #CmonCraig trending during Craig Morrison’s English Channel solo in July 2012. By the 5-hour feed, I was starting to feel a little bit more positive. I no longer felt like I was going to fall asleep in the water and could see that the next headland was getting nearer. 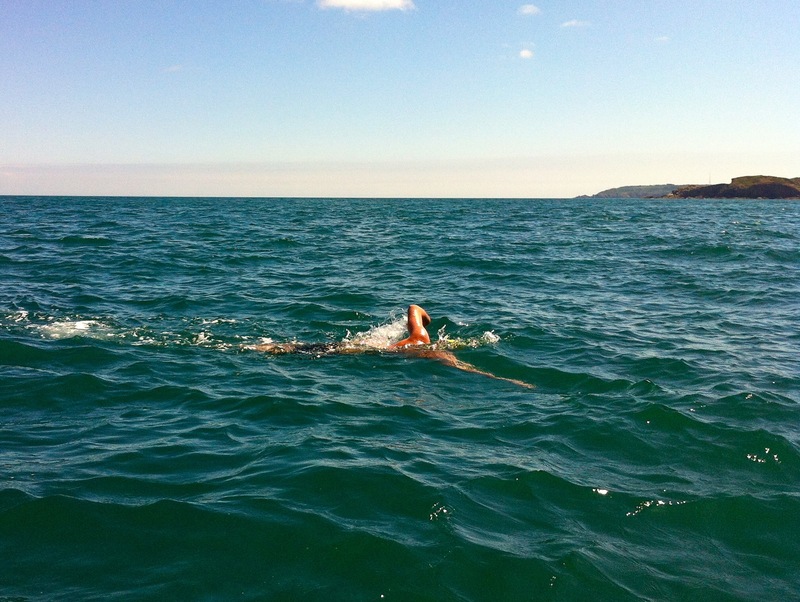 I took the feed (300 ml of warm High5 4:1), kept my mouth shut and swam on – that was me able to tell myself to keep going rather than needing the crew to tell me. By the next feed, I was feeling more confident still: I knew that if I lasted another 30 minutes we would be switching to the 1-hour feed cycle, as scheduled, and this would make a big difference psychologically. I took the gel and asked for some jelly babies at the next feed as a treat. A few minutes after the feed (5 hours 40 minutes in), I could see that we were rounding Grosnez and about to head south along the western side of the island. 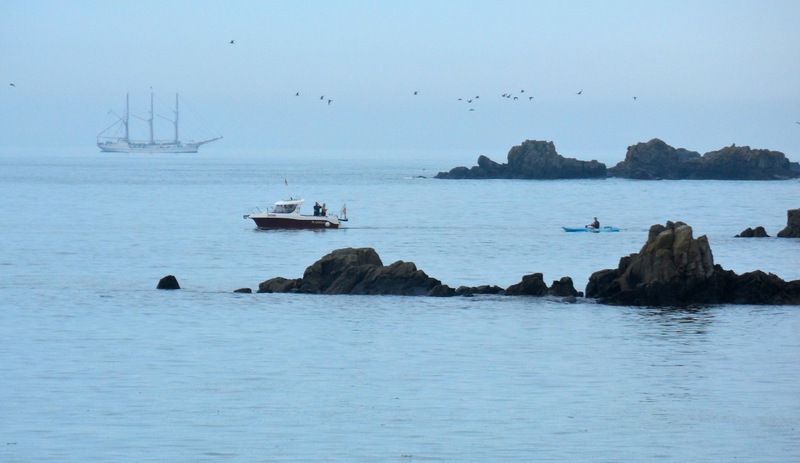 I was mentally prepared for a long slog across St. Ouen’s Bay from L’Etacq to La Corbière as I was told that you lose much of the tidal assistance at this point and it’s further than it looks! I told myself to swim feed-to-feed and I’d get there eventually. At this point, the crew started transcribing some of the encouraging tweets onto the back of my feed schedule and showing them to me which was nice. 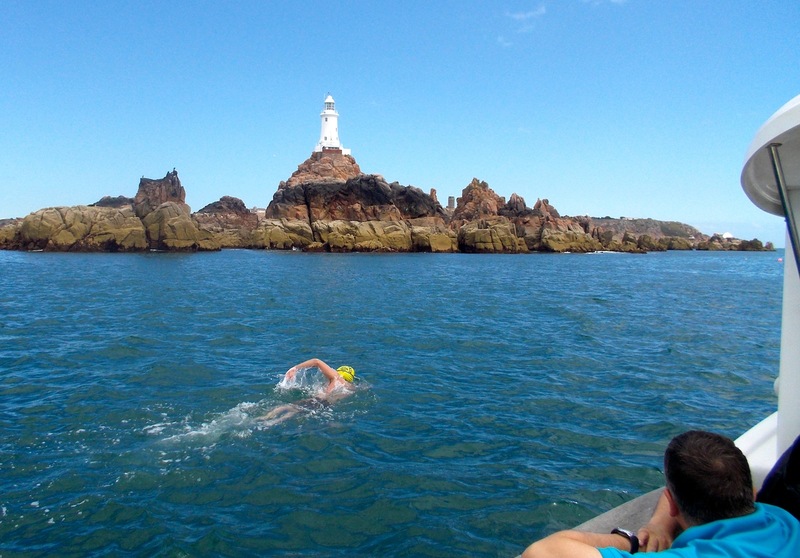 Approaching the lighthouse at La Corbière on the southwestern corner of the island. Approaching Noirmot after the last feed, the last landmark before the end of the swim! This is my favourite photograph from the swim. A few minutes later, we rounded the point and headed straight across the bay. My stroke rate was back up to 65 spm at the 9-hour mark. The next time a sighted forward, I could just about make out the diagonal black and white markings at the end of Elizabeth Castle Breakwater. Though it was already very calm, the surface of the water flattened out even more as we progressed across the bay – it became “glassy” and I felt like I was swimming in Knockananig Reservoir on a dead summer’s day. The crew seemed to be getting excited at this point, doing plenty of waving, cheering and clapping – it’s amazing how much of a boost a bit of noise can give you – and the more noise they made the harder I swam. I began to sight more often as well to be able to judge more accurately how hard I could afford to swim at each point. 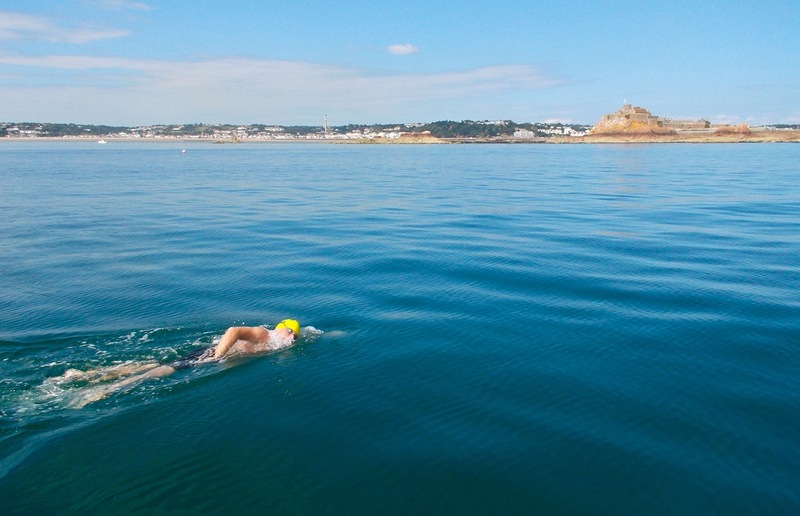 Crossing St. Aubin’s Bay, the black and white marks at the finish line visible. About 35 minutes after the last feed, I asked the crew (without breaking stroke) for a caffeinated gel. I could see Alice get one ready but it soon disappeared, they crew didn’t want to stop at this point as we were so close to the record. Mick appeared from inside the cabin and signaled that I had 10 minutes to go. John, who I hadn’t seen for about 7 or 8 hours, then appeared which made me think that we must be very close! Then all the crew signaled that I had 5 minutes left – I looked up and could see the finish only a few hundred metres away. 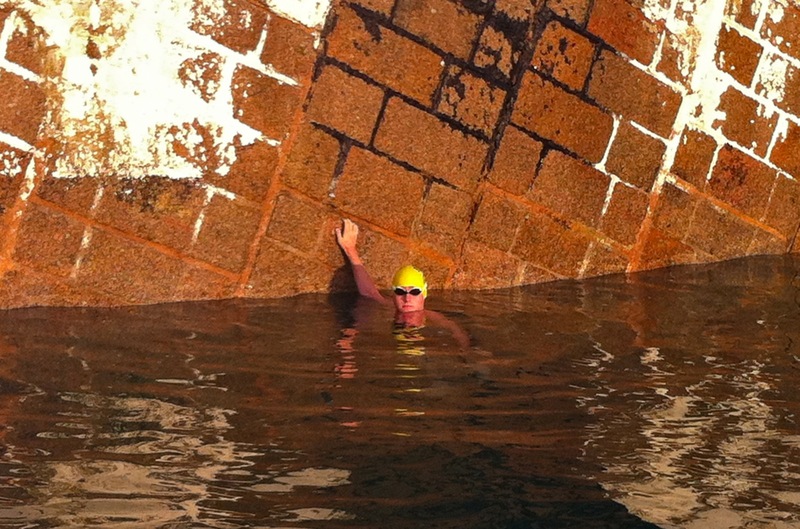 I put my head down and swam as fast as I could, having not fed for 40 minutes, for the breakwater. I touched the barnacle-encrusted wall (right behind where I started) very relieved to be finished. I gave the crew a thumbs-up, tumble-turned and kicked off the wall back to the boat. I managed to haul myself back onboard with some dignity and the crew told me my time: 9 hours 35 minutes. Finished – 9 hours 35 minutes later! 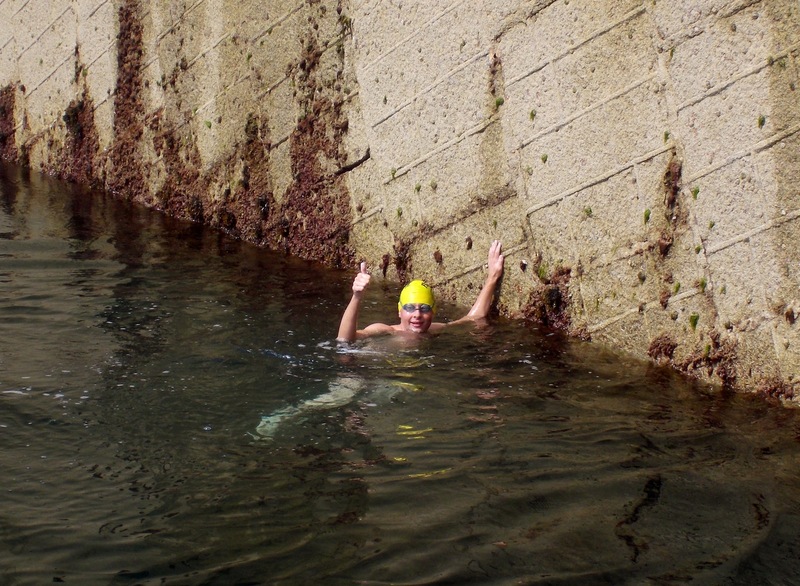 I celebrated with a pool-style tumble-turn at the breakwater. 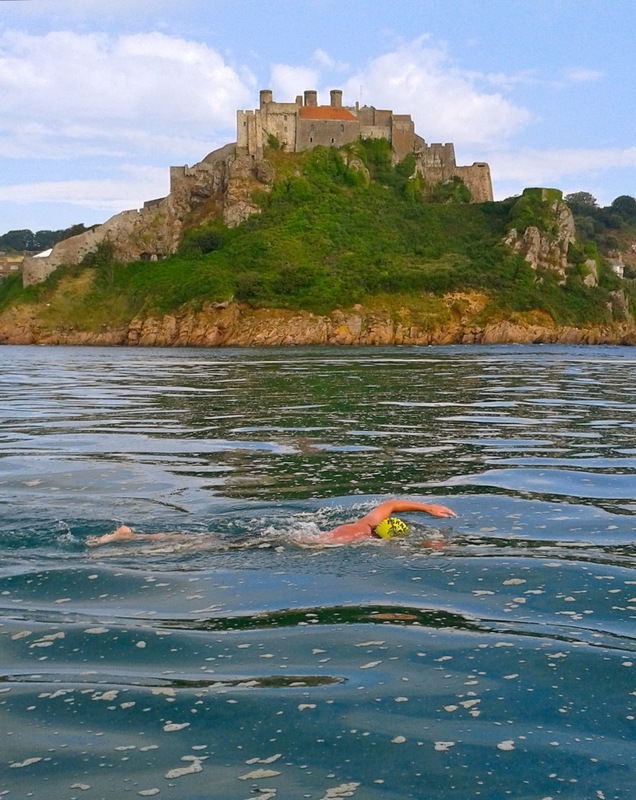 Touching the end of Elizabeth Castle Breakwater in the morning sun to start the swim. I was picked up from my guest house at 5:30 am by Mick, Marilyn and Chantelle Le Guilcher and Alice Harvey. They were, as was I, a little concerned at how little stuff I seemed to have with me – it didn’t look like I was prepared for a day’s swimming! It was a 5-minute drive to the marina where we met co-pilot John Asplet and kayaker Martin Powell. We walked along the pontoons to the boat, a nice new half-decker with plenty of crew space. All set up, we motored out of the harbour to the end of Elizabeth Castle Breakwater, towing Martin in the kayak behind us. There was a short discussion with the Coast Guard about shipping movements that morning: there was only one ship due out but they were delayed by 5 minutes so we got the all-clear to start. I got changed and greased up and jumped into the clear water. 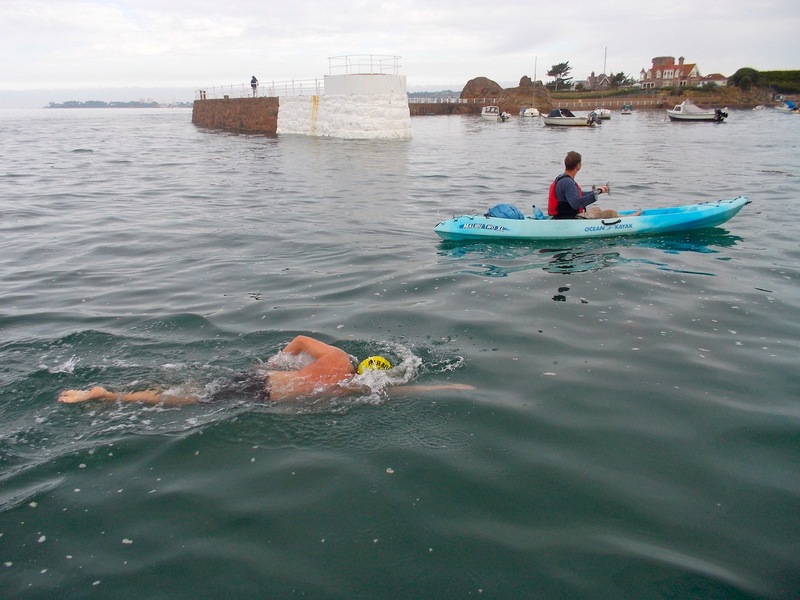 The rule is that you must be touching the breakwater to officially start the swim – I did this, pushed off the wall (with a few dolphin kicks) and was on my way at 6:27 am. Navigating through the Gutters about 1 hour into the swim. This is why you need a kayak! The first 2 hours of the swim were pretty uneventful. It was calm and not in the slightest bit cold. I followed Martin in the kayak while the boat navigated its way through the many rocky reefs off this part of the island. 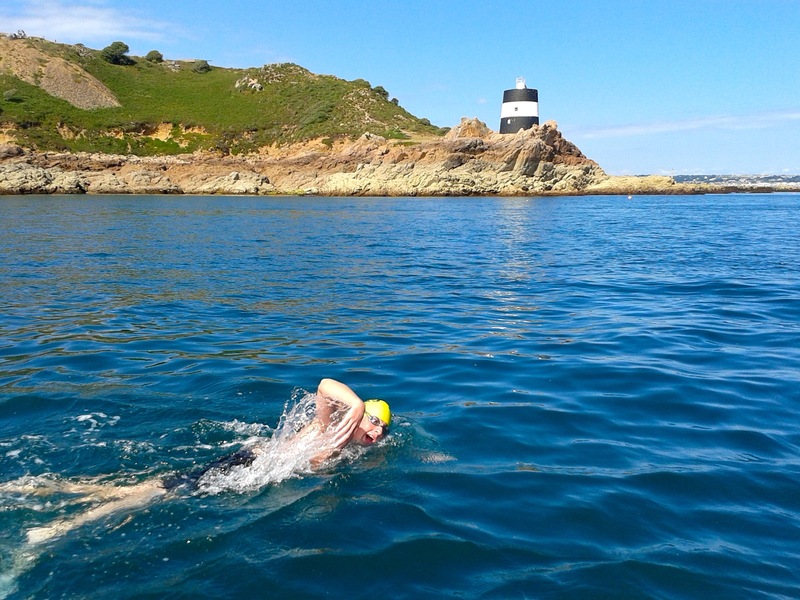 I had my first feed of 300 ml (warm) of High5 4:1 after 30 minutes and passed Green Island after 44 minutes (Chantelle says that the average swimmer reaches this point at around 1 hour). I had the same feed again at the 1-hour mark and an SiS GO Isotonic Gel (60 ml; blackcurrant flavour) after 1 hour 30 minutes. By now we were at La Rocque pier and I was feeling very strong. My stroke rate to this point was a steady 67 strokes per minute (spm) and I was feeling good. Swimming past the end of the pier at La Rocque: Martin kayaking and Marilyn waving from the pier. As we approached the pier, I could really see the speed at which we were moving. The video below should give you some idea of the tidal assistance that I was getting at this point. My apologies for the poor quality of the video – it looks well on my phone and my laptop but I’m not very good with uploading to YouTube yet! 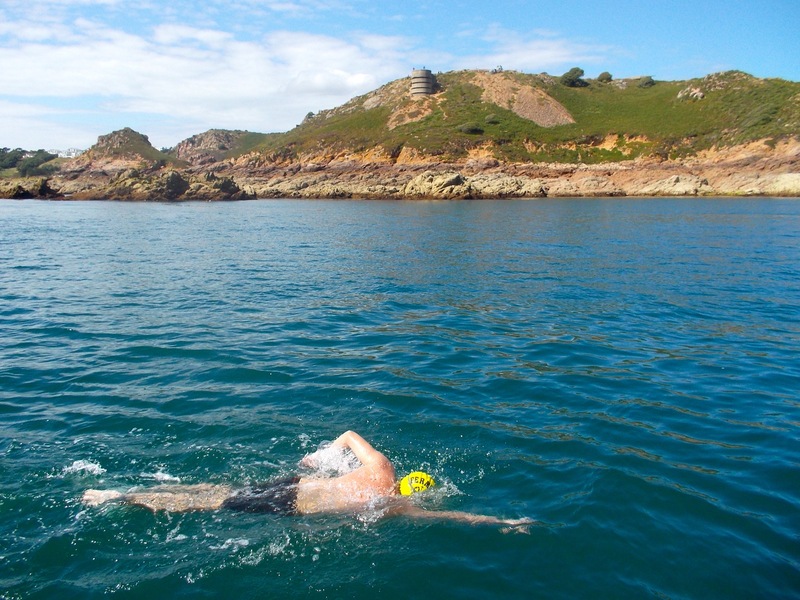 After passing the pier, we were clear of any reefs so Martin was free to head for shore and exit at Seymour slip. I now had to follow the boat instead of the kayak. I was a small bit surprised as I thought I had at least another 20 minutes left of following the kayak. We were now headed north across the Royal Bay of Grouville, though I thought we were still heading east! There was a lot of seaweed and scum on the surface but nothing as bad as Sandycove during the winter. The water was like glass and my stroke rate was 68 spm. I carried on to the next feed, 300 ml of High5 ZERO at the 2-hour mark, completing one of my 2-hour feed cycles – I planned to do another two of these, taking me up to the 6-hour mark, before switching to 1-hour cycles. The next major landmark was Mont Orgueil Castle above Gorey Harbour. I could see the castle up ahead and was told to aim for the sailboat moored below it. I couldn’t see that very well so asked for a change of goggles. It seemed a bit bright with the clear goggles at first, and they also seemed a bit tight, but they settled down and I had much better visibility than I’d had earlier in the swim. The castle was an impressive sight as I swam past it. More importantly, however, I could see St. Catherine’s Breakwater up ahead. On my fifth feed, Mick told me that if I could get to the breakwater in 10 minutes I’d be level with Julieann Galloway‘s progress, i.e. on world record pace! I put in a solid 10 minutes of swimming and made the end of the breakwater bang-on Julieann’s time and travelling at over 6 knots (obviously heavily tide-assisted). I kept up this pace well past the breakwater. We didn’t head west close to the island, instead heading north to where Mick could find some good tidal runs. Even way out from the island it was still flat calm! Passing the mast near the quarry on the northern side of the island – the half-way mark! I was reluctant to believe them, conscious of the fact that still wasn’t 4 hours in, but reconciled it by reminding myself that the spatial and temporal half-way points were not necessarily the same. By now, we were a long way off the coast so even though we were moving very fast, it wasn’t as noticeable to me and this was a psychological anticlimax. As well as that, I was still swimming in a high gear – I had been for well over an hour. This wasn’t a good combination and I became mentally and physically fatigued at the same time. My stroke rate hadn’t dropped much though (down to 65 spm). At the 4-hour feed, I asked the crew if I could have some chocolate at the next feed. They kindly gave me some out of their own stash! Approaching Grosnez about 5 hours into the swim. I’ll write about the second part of the swim in Part 3 of the report tomorrow.